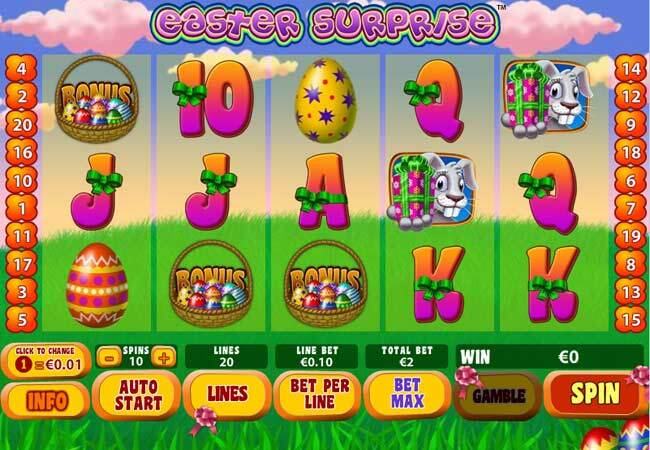 Easter Surprise is a fun themed slot game released especially to get everybody into the easter and spring time mood. It is everything you would expect from a video slot game released by Playtech. Sharp and crisp graphics complement the fast fun pack game play. All the usual extras are here. Wild Symbols, Scatters and bonus. Collect the right combination of symbols for a huge payout, get free spins with multiplier, or enter the easter bonus game. Pick eggs and win a cash prize.